If you’ve been searching for a dentist in Denver, NC, then you’re in luck. At Summit Family Dentistry, we’re always striving to be the best of the best. There’s nothing that matters more to us than our patients, and we go above and beyond to show it. But what do our patients think of us? That’s what really matters, of course, and that’s why in today’s post we’d like to share a handful of recent reviews that we’ve gotten. We’re certainly not doing this to toot our own horn or anything, but instead, we simply want to share these reviews because we’re proud to have gotten them. If you’re wondering what others are saying about our dental clinic, keep reading to learn more! A quick Google search (or if you’d prefer, you can simply click this link) will show you that as of the time of this writing, we’re sitting at a perfect 5-star rating based on 78 reviews. We have to be honest — this absolutely blows us away! We’re so thrilled that people appreciate what we do, so we’d like to preface this all by saying thank you from the bottom of our hearts. So without further ado, here are a few recent reviews that we’d like to share. Here’s the truth: some businesses out there only like to share the positive reviews on their website. In this day and age, however, information is everywhere. That’s why we’d like to invite you to take a look around the internet and see for yourself what people are saying about Summit Family Dentistry. We believe that when you do your job the right way, you don’t have anything to hide. Whether it’s on Facebook, Yelp, Yahoo, or Mapquest (yes, apparently Mapquest allows people to leave reviews now! ), you’ll find a perfect rating. Once again, the goal isn’t to toot our own horn, but that really is pretty much unheard of. At the end of the day, we credit it to our dedication to doing quality work at fair prices. And it doesn’t hurt that we’re all so friendly either! When it comes right down to it, you definitely have a choice in who you see when you’re in need of a dentist, but we want you to know that we’ll always go above and beyond for our patients, providing them with affordable services and smiling faces. It doesn’t get much better than that! So feel free to browse the internet, ask your friends who have seen us, or whatever else you need to do. 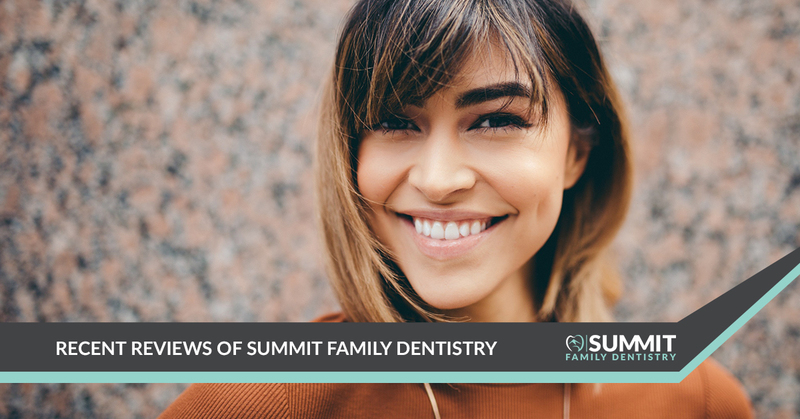 When you’re ready, contact us to schedule an appointment, and rest assured that you’re in good hands at Summit Family Dentistry. We look forward to hearing from you!